Why has environmentalism failed to solve the sustainability problem? SIP incorporates Social Force Diagrams and The Six Laws of Root Cause Analysis. Each subproblem is analyzed using a Social Force Diagram plus feedback loop simulation models as necessary. Most people have great difficulty determining what matters and what doesn't when solving a problem in an area they are unfamiliar with. How can you separate the wheat from the chaff? How can you find the 20% so you can apply the 80-20 rule? If you can't determine what matters and study that, then you can't solve the problem. 1. What are the critical subproblems? 2. What are the root causes of each subproblem? 3. What are the high leverage points for resolving the root causes? Everything else follows from these questions. Each is a "find what matters" question that builds on the question before it. When you've answered all three questions you're done with the analysis. You've found what matters. 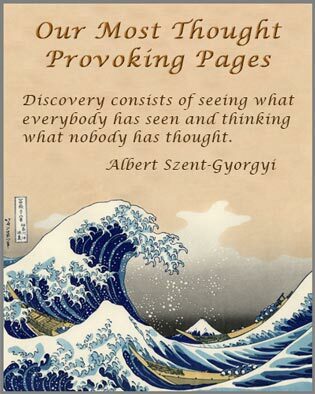 After that, converging on solutions to push on the high leverage points is relatively easy. Next we give a brief introduction to SIP. For a full description of the process, an example of how it can be applied, and a collection of sample solution elements produced by the process, see Common Property Rights: A Process Driven Approach to Solving the Complete Sustainability Problem. A. How to overcome change resistance. Presently the human system is strongly resisting changing from unsustainable to sustainable behavior. B. How to achieve proper coupling. Presently the human system is improperly coupled to the environment. The feedback loops necessary for sustainable environmental impact are simply not there. C. How to avoid excessive model drift. The model governments use to run themselves is incapable of solving the sustainability problem. It has drifted so far from what's needed that it's broken. Without this decomposition the problem is insolvable because you are trying to simultaneously solve all three subproblems at the same time without realizing it. That's one reason why the environmental movement has been unable to solve the sustainability problem. Environmentalists are blind to the need to treat "How to overcome change resistance" as a separate problem and solve that first. 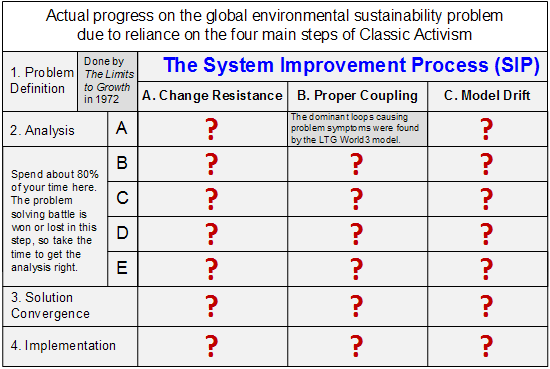 Once change resistance is overcome the system will "want" to be sustainable. It will eagerly adopt proper coupling solutions like carbon taxes, strict pollution laws, and sustainable product life cycle design. Each subproblem then goes through the steps of analysis, solution convergence, and implementation as shown below. In step 2 of Classic Activism, the proper practices are the practices required to live sustainably, like renewable energy, less pollution, and supporting the Kyoto Protocol on climate change. Not only does Classic Activism fail to use proper decomposition. It also has no analysis step. This huge flaw is the second reason the world has been unable to solve the sustainability problem. Without deep analysis, how can you possibly solve a difficult problem? These are listed below. 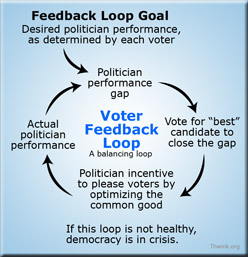 Note how the substeps use feedback loop modeling to find the root causes and then the high leverage points for resolving the root causes. The analysis step is so difficult and crucial it's where you should spend about 80% of your time. If your root causes and high leverage points are reasonably correct, then steps 3 and 4 will be relatively easy. But if your analysis is wrong, no amount of brilliant hard work in steps 3 and 4 will solve the problem. 1. Find the immediate cause of the subproblem symptoms in terms of the system’s dominant feedback loops. 2. 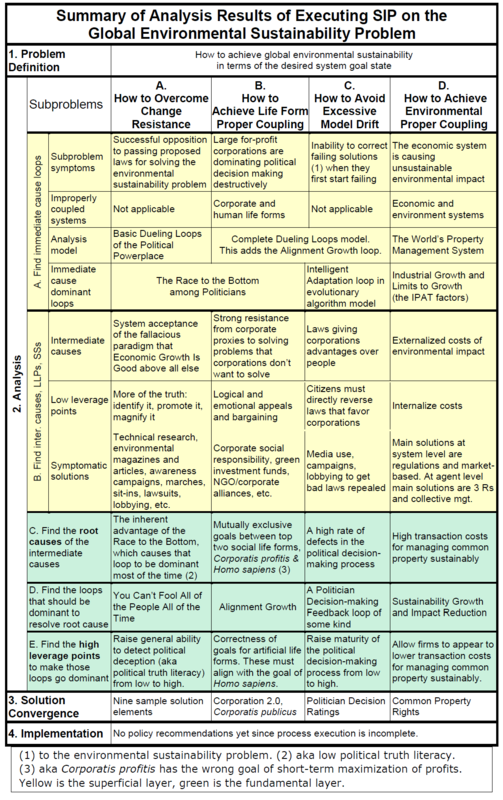 Find the intermediate causes, low leverage points, and superficial (symptomatic) solutions. 3. Find the root causes of the intermediate causes. 4. Find the feedback loops that should be dominant to resolve the root causes. 5. Find the high leverage points to make those loops go dominant. Why has environmentalism failed to solve the sustainability problem from the perspective of SIP? Once you grasp how SIP works, you will see it contains the minimum steps required to solve the problem. All three subproblems are required. Root causes must be found for each subproblem. So must the high leverage points. Then, once analysis is complete the solution convergence and implementation steps can follow. As SIP sees it, problem solvers have completed only 2 steps. Both were admirably done by The Limits to Growth in 1972. But what have the super sleuth’s of the world been doing since then? Where are the results for the rest of the process or one something like it? I’ve searched for years, but they are nowhere to be found. Instead, what we find are the artifacts of Classic Activism, like what should be done and why we have to do it and please let’s do it now, because if we don’t…. Still, Jay Forrester, the Club of Rome, Dennis and Donella Meadows, Jorgen Randers, and the rest of the 17 person Limits to Growth team pulled off a precocious miracle. They spotted a problem few had noticed and wrestled it into a form that allowed them to complete the first two steps. For discussion of the table please see Summary of Analysis Results. For a more detailed description of SIP please see The Right Tools film. 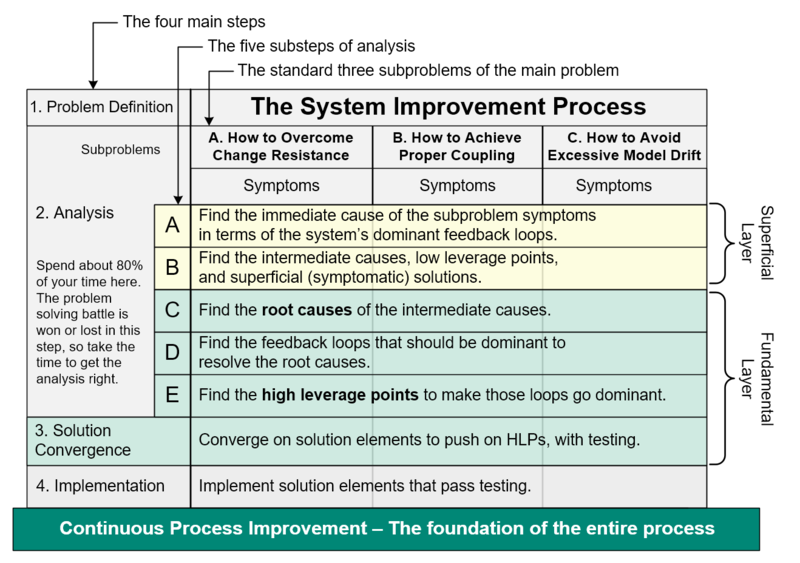 For the full description see the chapter on The System Improvement Process in the Cutting Through Complexity book. We now have a short pamphlet describing how SIP works. After that try one of our recent papers, the one on Building a Foundational Framework for Sustainability Science with Root Cause Analysis and the System Improvement Process. Every difficult problem requires some type of process to solve it. If all you do is solve problems, then your problem solving process is your most valuable asset. It's even more important than your people, because without a stellar process, even stellar people cannot solve truly difficult problems. The Scientific Method, a five step process that forms the foundation of all of science. The evolutionary algorithm, a natural process identified by Charles Darwin in 1859 in his On the Origin of Species. For more see The Cycle of Evolution. Double entry accounting, a process for tracking and understanding the flow of money in business. Without it business would be unable to calculate the profitability of a decision. Profits could not be calculated, which means dividends could not be paid. DNA sequencing, a complex process for determining the makeup of a molecule of DNA. This process has become the core of genetic engineering because it offers a map to what you have and where you want to go. Six Sigma, a quality improvement process. According to iSixSigma, "General Electric, one of the most successful companies implementing Six Sigma, has estimated benefits on the order of $10 billion during the first five years of implementation." The mass production assembly line, first perfected by Henry Ford in 1908 to 1915 for production of the Model T automobile. The new process allowed production of the world's first affordable car, one that could be widely purchased by the middle class.